In Stock Now!! Buy Today!! 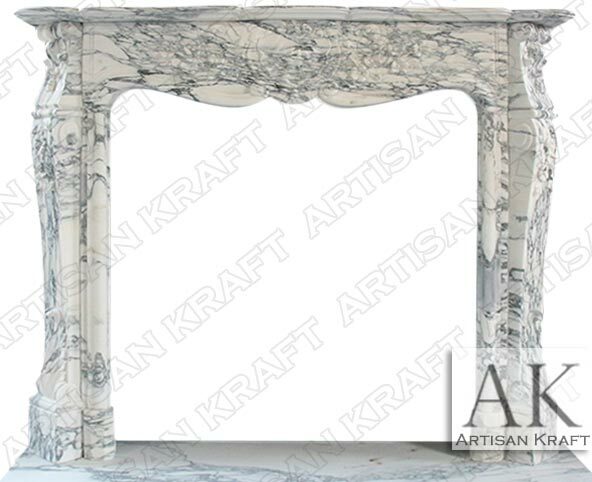 St. Louis Fireplace Surround is pictured here carved from Italian Arabescato marble. Italian Arabescato marble is a high end beautiful stone that costs more than Carrara. The quality and overall beauty is much higher than that of Carrara. That is why this mantel is part of our exclusive Black Label Collection. The black veining in the white stone is stunning. The hand carved details throughout are gorgeous. Saint Louis is a historic reproduction of fireplace surrounds found in France that were inspired by the Louis era. Many more historic reproductions can be found on our website and installed in our showroom.